Party and linen rental operations require laundry processes that deliver superior results and a quick turn-around. By selecting the right laundry equipment – washer-extractors, industrial ironers, flatwork folders and drying tumblers – they can dramatically boost laundry productivity, while using less labor, water, natural gas and electricity. 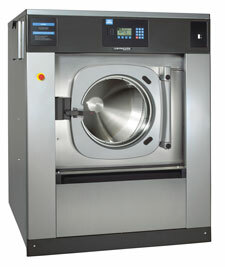 Continental soft-mount E-Series Washers allow businesses to complete more laundry in significantly less time! Because E-Series Washers deliver extract speeds up to 400 G-force, they remove considerably more water from every load, when compared with lower G-force hard-mount washers. Because more moisture is removed during extract, dry time is cut by up to 50 percent – improving laundry production and cutting natural gas usage! Continental washers and dryers offer advanced programmability and one-touch operation. Washers deliver automatic chemical injection and programmable water temperatures, water levels, number of baths, rotation action, G-force extract, and more. Operators just enter a program number and press start. By pairing Continental Washers and Flatwork Ironers, linen rental companies further boost production and quality. Items are fed directly from the washer into the ironer – bypassing the dryer. Goods are perfectly ironed without dryer preconditioning. Boosting productivity and quality further, some rental companies combine ironing and folding, as well. A Continental flatwork folder quickly and automatically folds table linens. This space-saving all-in-one machine automatically feeds, irons, folds, stacks and accumulates a variety of flatwork items.